Often billed as a football comedy, I'm not sure The Longest Yard really is one. 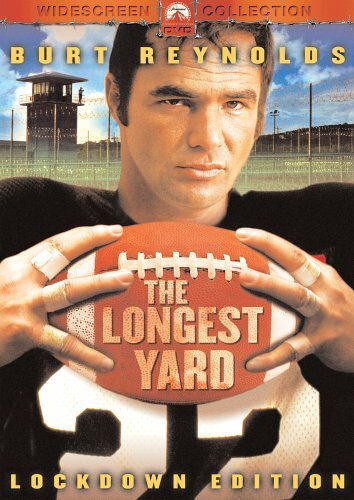 Starring a young Burt Reynolds, The Longest Yard is, simply, a good movie. Reynolds is Paul "Wrecking" Crewe, a former NFL star quarterback who has been out of the game for eight years. He's not a very good man. He is selfish, treats a woman poorly (who is also treating him poorly when we meet her), drives drunk, wrecks her car, assaults a police officer, and doesn't really take anything seriously. Crewe is sentenced to prison where the warden (Eddie Albert) wants Crewe to help coach his semi-pro football team and help with the championship. To make a long story short Crewe declines, gets put on a nasty work detail and in the end has to put together a football team made up of inmates to give the warden's team a proper warm-up game before their season starts. Crewe has ideas on what exactly he should be doing and how to best protect himself and proceeds to put together a team of the nastiest, toughest inmates in the prison. The joke will be on the warden because some of the guards are on the warden's team and the inmates are out to hurt them. There are moments of humor as Crewe cracks wise as often as he can and there is some situational comedy with the football, but this is not a terribly funny movie. It's just a well told, well acted story. The backstory of Crewe having shaved points off of a football game comes into play several times in the movie and everyone here does an excellent job making the characters real and raw, and the action believable yet entertaining. It is easy to see why Hollywood wanted to remake this movie, but that is another topic best left for another time. Despite being a person who loves to watch movies, my experience with Burt Reynolds is rather limited. I loved his performance in Boogie Nights, but otherwise I only know him from The Cannonball Run and Smokey and the Bandit. This is unfortunate because Reynolds certainly can be a good actor and he is quite good here in The Longest Yard. Fans of movies and football movies need to see this one. It is well worth the two hours and it holds up quite well.